The President of the Democratic Republic of the Congo, is the head of state of the Democratic Republic of the Congo and commander-in-chief of the armed forces. The Union for Democracy and Social Progress is one of the major contemporary political parties in the Democratic Republic of the Congo along with MLC. The party has the lengthiest record of continuous operation in the Democratic Republic of the Congo. Étienne Tshisekedi wa Mulumba was a Congolese politician and the leader of the Union for Democracy and Social Progress (UDPS), the main opposing political party in the Democratic Republic of the Congo (DRC). A long-time opposition leader, he served as Prime Minister of the country on three brief occasions: in 1991, 1992–1993, and 1997. Kinshasa is the capital and the largest city of the Democratic Republic of the Congo. The city is situated alongside the Congo River. The Kasai region of the Democratic Republic of the Congo is divided administratively into Kasai-Occidental and Kasai-Oriental. It shares its name with the Kasai River. The National Assembly is the lower house and main legislative political body of the Parliament of the Democratic Republic of the Congo. It was established by the 2006 constitution. Kasai-Oriental is one of the 26 provinces of the Democratic Republic of the Congo. Specified under Article 2 of the country's 2006 Constitution, the new province was finally created in 2015 from Tshilenge District and the independently administered city of Mbuji-Mayi, both part of the larger, pre-2015 Kasai-Oriental province. The new province's territory corresponds to the historic Sud-Kasaï province that existed in the early period of post-colonial Democratic Republic of the Congo between 1963 and 1966. A rapporteur is a person who is appointed by an organization to report on the proceedings of its meetings. The term is a French-derived word. The Independent National Electoral Commission is the body that runs elections in the Democratic Republic of the Congo. Martin Madidi Fayulu is a businessman and lawmaker from the Democratic Republic of the Congo. He is the leader of the Engagement for Citizenship and Development party. On 11 November 2018, he was chosen by seven opposition leaders to be their joint presidential candidate in the 2018 Democratic Republic of the Congo general election. However, within 24 hours, Félix Antoine Tshisekedi Tshilombo, the eventual winner of the 2018 presidential election and Vital Kamerhe, the other oppositional candiate, rescinded their endorsement of his candidacy and formed their own pact with Tshisekedi as candidate. Emmanuel Ramazani Shadary is a politician in the Democratic Republic of the Congo, who was a presidential candidate in the December 2018 presidential elections in the country. He was selected following consultations within the ruling People's Party for Reconstruction and Democracy (PPRD) political party and the Common Front for Congo (FCC), political coalition. Shadary is the permanent secretary of the PPRD, and has previously served as the country's Interior Minister. The region that is now the Democratic Republic of the Congo was first settled about 80,000 years ago. The Kingdom of Congo remained present in the region between the 14th and the early 19th centuries. Belgian colonization began when King Leopold II founded the Congo Free State, a corporate state run solely by King Leopold. Reports of widespread murder and torture in the rubber plantations led the Belgian government to seize the Congo from Leopold II and establish the Belgian Congo. Under Belgian rule numerous Christian organizations attempted to Westernize the Congolese people. Direct elections in the Democratic Republic of the Congo occur for the Presidency, National Assembly, and provincial assemblies. The Senate, the upper house of the legislature, is elected indirectly by members of the provincial assemblies. Antoine Gizenga was a Congolese (DRC) politician who was the Prime Minister of the Democratic Republic of the Congo from 30 December 2006 to 10 October 2008. He was the Secretary-General of the Unified Lumumbist Party. 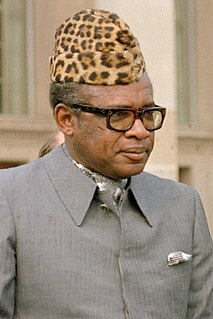 François-Joseph Mobutu Nzanga Ngbangawe is a Congolese politician. A son of the long-time President Mobutu Sese Seko, he served in the government of the Democratic Republic of the Congo under President Joseph Kabila from 2007 to 2011, initially as Minister of State for Agriculture and subsequently as Deputy Prime Minister for Basic Social Needs. He was dismissed from the government in March 2011. Vital Kamerhe is a Congolese politician and leader of the Union for the Congolese Nation, an opposition political party. He was President of the National Assembly of the Democratic Republic of the Congo from 2006 to 2009. After resigning from that office, he went into opposition and founded the UNC. Kamerhe was a candidate in the 2011 presidential election. Presidential and parliamentary elections were held in Democratic Republic of the Congo on 28 November 2011; a facultative run-off on 26 February 2012 was shelved with a change in election laws. Médard Mulangala Lwakabwanga is a politician from the Democratic Republic of the Congo. He is President of the Union for a Republican Majority and a leader of the Union Sacree pour l’Alternance, an umbrella grouping of opposition parliamentary parties and community groups that forms the third-largest political structure within the opposition and Rapporteur of the National Assembly’s Committee on Economics and Finance, making him the opposition’s lead spokesman on budgetary, economic and investment policy in the Republic. Frédéric Kibassa Maliba was a politician in the Democratic Republic of the Congo (DRC). Kibassa held the positions of Deputy Minister of Mines and then Minister of Mines in the Laurent-Désiré Kabila government. He was accused of misappropriating funds in June 2000, while he was Minister of Mines. Samy Badibanga Ntita is a Congolese politician who was Prime Minister of the Democratic Republic of the Congo from November 2016 to May 2017. Nicolas Kazadi is a Congolese politician and career diplomat who has been Ambassador-at-large for the Democratic Republic of the Congo since 7 March 2019. Wikimedia Commons has media related to Félix Tshisekedi . 1 2 "REFILE-Opposition leader Felix Tshisekedi sworn in as Congo president". 24 January 2019 – via af.reuters.com. 1 2 "Félix Tshisekedi investi candidat du parti historique d'opposition UDPS en RDC" (in French). Voice of America. 31 March 2018. Retrieved 25 May 2018. 1 2 Boisselet, Pierre (15 June 2017). "RDC : Félix Tshisekedi, au nom du père". Jeune Afrique (in French). Retrieved 26 May 2018. 1 2 "Opposition named winner in DR Congo poll". BBC News. 10 January 2019. Retrieved 10 January 2019. ↑ Clowes, William (25 May 2018). "Congo Opposition Leaders Mull Unity Candidate for Delayed Vote". Bloomberg News . Retrieved 25 May 2018. ↑ "DRC president Tshisekedi names coalition ally as Chief of Staff" . Retrieved 29 January 2019. ↑ Williame, Jean-Claude; et al. (1997). Zaire: Predicament and Prospects. DIANE Publishing. p. 3. ISBN 0-7881-7042-2. 1 2 3 4 "Félix Tshisekedi Premier ministre à la place de Samy Badibanga?". Politico.cd (in French). 23 December 2016. Retrieved 25 May 2018. ↑ " Je ne tiens pas à mettre ma carrière politique entre parenthèses "
↑ "Tshisekedi's son leads DRC's main opposition party". The Herald . 2 April 2018. Retrieved 25 May 2018. ↑ "Surprise Winner of Congolese Election Is An Opposition Leader". NPR. Retrieved 10 January 2019. ↑ Bujakera, Stanys (January 19, 2019). "Congo top court declares Tshisekedi winner of presidential poll". Reuters. Retrieved 20 January 2019. ↑ "SA urges 'all parties' to accept Tshisekedi's DRC win" . Retrieved 20 January 2019. ↑ Steinhauser, Gabriele; Norman, Laurence (24 January 2019). "Félix Tshisekedi Is Sworn In as Congolese President" – via www.wsj.com. ↑ "DR Congo: Tshisekedi takes office, but Kabila's legacy casts long shadow". France 24. 24 January 2019. ↑ "New Congolese President Pardons About 700 Political Prisoners". NPR.org. Retrieved 14 March 2019.